A giant new backpackers hostel in Queenstown has opened for business. The 276-bed, five-storey Jucy Snooze hostel, on the corner of Camp and Memorial Sts, will officially open on Friday, but opened its doors for its first guests on April 6. The development - first revealed in the Mountain Scene two years ago - uses the same "pod'' concept as the company's 282-bed hostel that opened next to Christchurch International Airport in 2016. Rooms accommodate eight travellers in a "bunk room" style configuration. As well as some private rooms with en suites, it has pod rooms that accommodate eight guests each. They have a bunkroom configuration, where guests close a blind to create a 2m-long individual sleeping space. Jucy chief executive Tim Alpe said its expansion into Queenstown was designed to meet the needs of the "millennial traveller'', but could also help meet demand from short-term workers. The hostel includes a rooftop pizzeria and bar that is also open to the public. Visitors can check-in themselves using a terminal in the lobby or a smartphone app, which can also be used to unlock their room. Each pod has a USB charger, climate control fan, lights, access to free Wi-Fi and a storage locker. 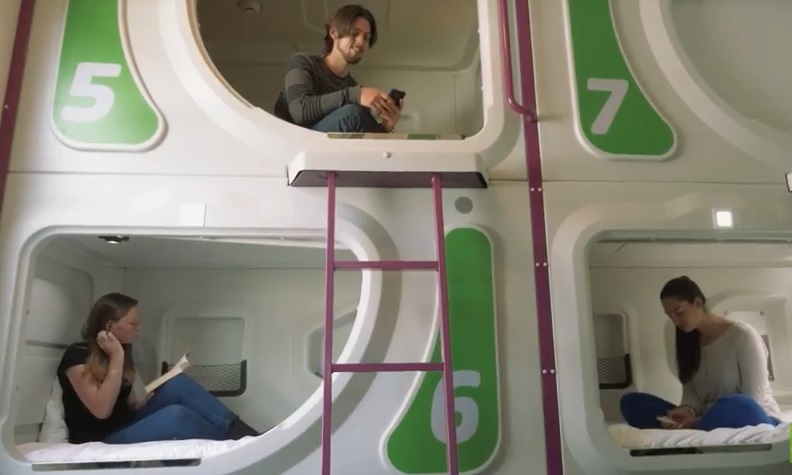 Most of the pod units are priced from $45 a night. The hostel is employing about 30 local staff.